Artistic programs for the community. 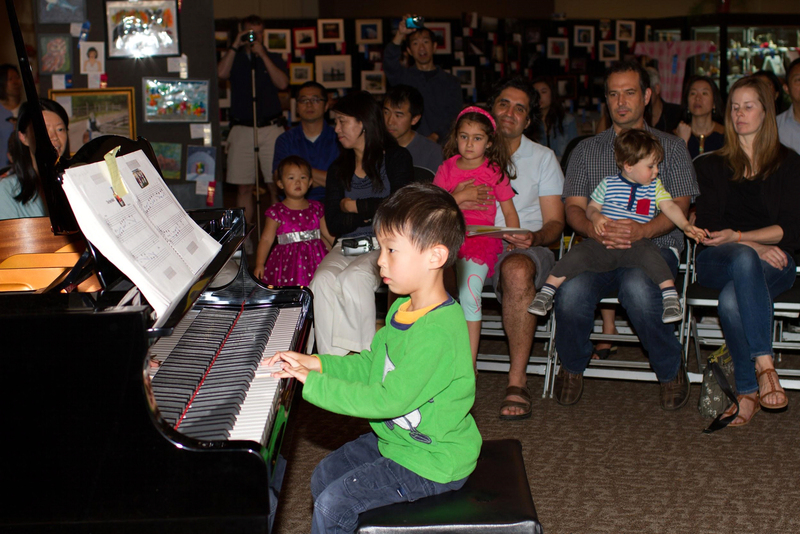 With generous support from California Humanities For All, Foster City Library & local musicians. 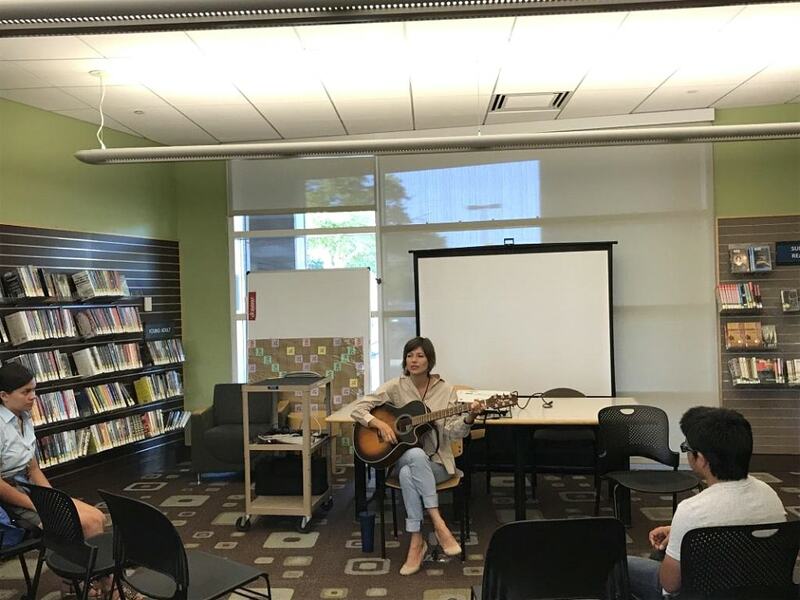 Digital Monkey School Foundation and the Foster City Library present Social Justice Through Music, a five-session weekly series. 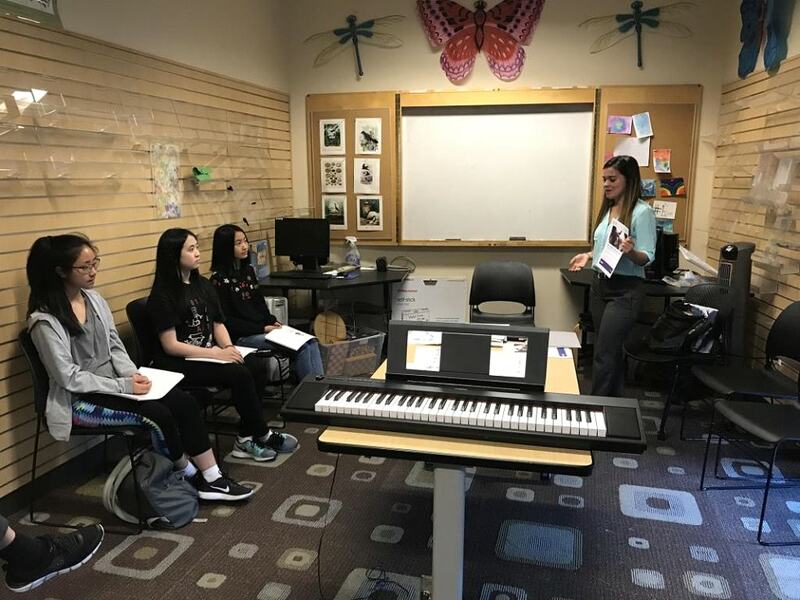 These workshops for middle school and high school musicians offer an opportunity for students to reflect on present-day social justice issues and give it form via individual expression. By the end of the series, young musicians will gain an understanding of the power and capacity of music as a cultural force. 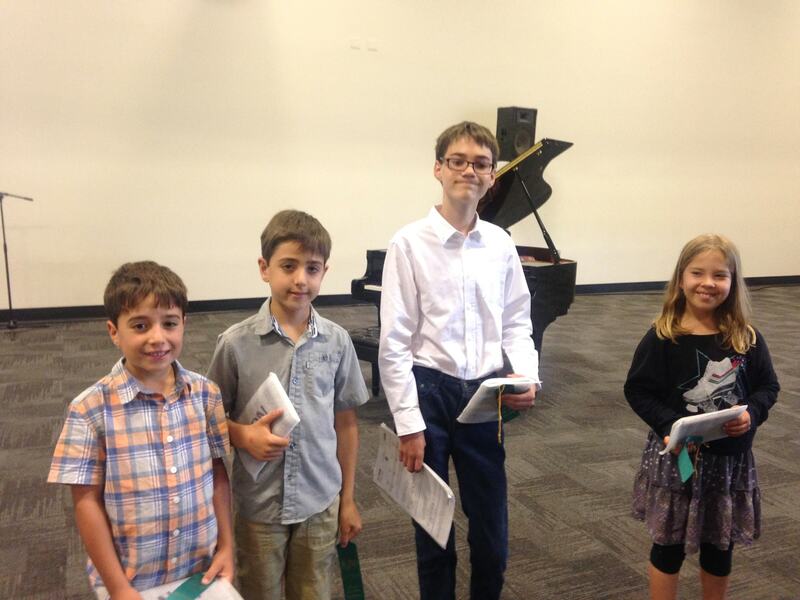 Then, they will convey their mastery of musical techniques and perform their own renditions of selections from our curriculum. The public is invited to attend the concert that showcases work by composers who expressed their social justice beliefs through their art, such as Beethoven and Gershwin along with artist from the 60’s, like Bob Dylan, along with modern songwriters who express their political views through music. The workshops also include open discussions with the audience. 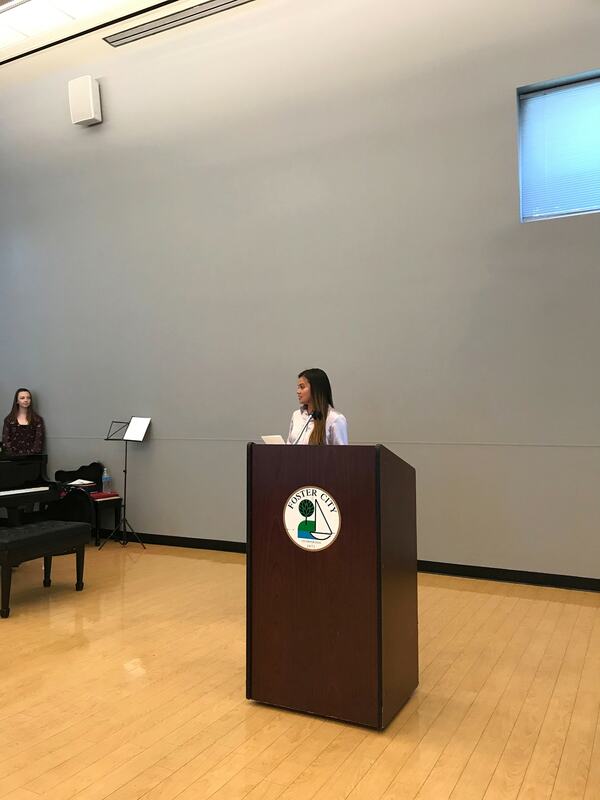 About the Program This program will appeal to students of diverse backgrounds who have an interest in social activism, music, and making a difference in their community. This timely and socially relevant curriculum is also a celebration of the pivotal role music has played in inspiring and reflecting social justice movements. We will take students on a guided exploration of the historically symbiotic relationship between music and social justice from the Classical and Romantic periods, and 20th Century genres, such as jazz and musical/tone poems. We will place social justice issues into the context of the time and place from which each emerged. Each week we’ll spotlight a different topic, from analysis of different techniques used in music to convey messages of equality and politics to exploration of different social justice issues. 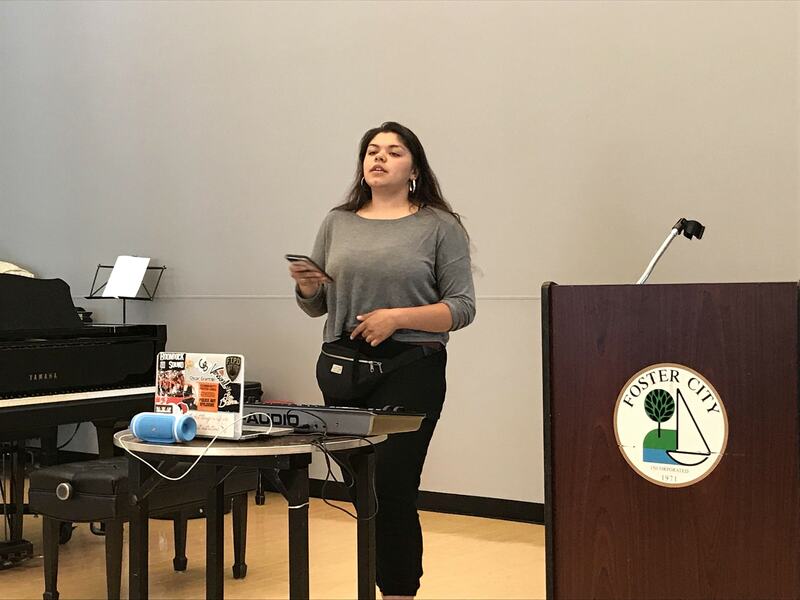 Opening day of Social Justice Through Music Workshop (July 3, 2018) featured a historical overview of different musical genres and their influences on prominent social justice movements. 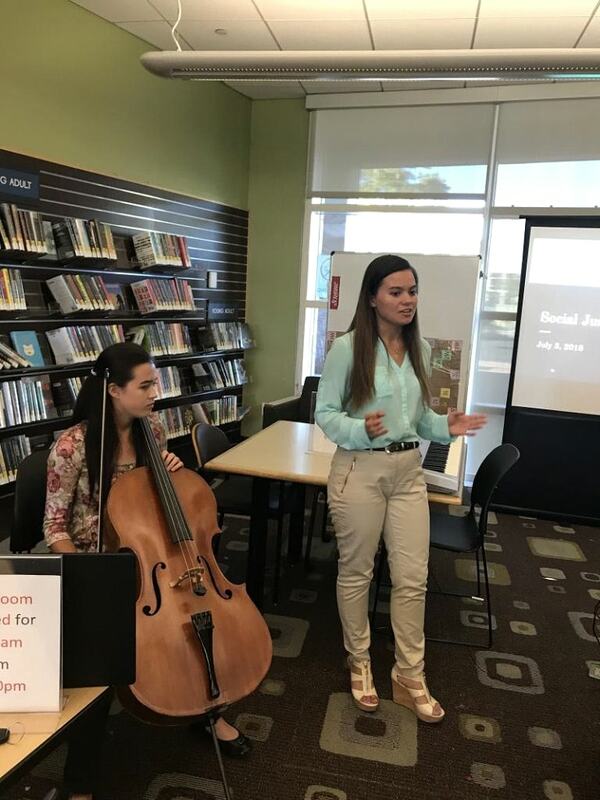 Social Justice Through Music workshop featuring live cello performances of the works of Joseph Haydn and Edward Elgar to compliment the discussion about the artists’ roles in social class movement and nationalism. Singer and songwriter Irina Mynchkin shares her covers of songs by Joan Baez, Neil Young, etc, which influenced many peaceful protest movements, along with her own composition about social unity. San Francisco hip hop artists La Niebla, Versoul, and Kyla Williams lead an interactive workshop about the five elements of hip hop, featuring their own live music. 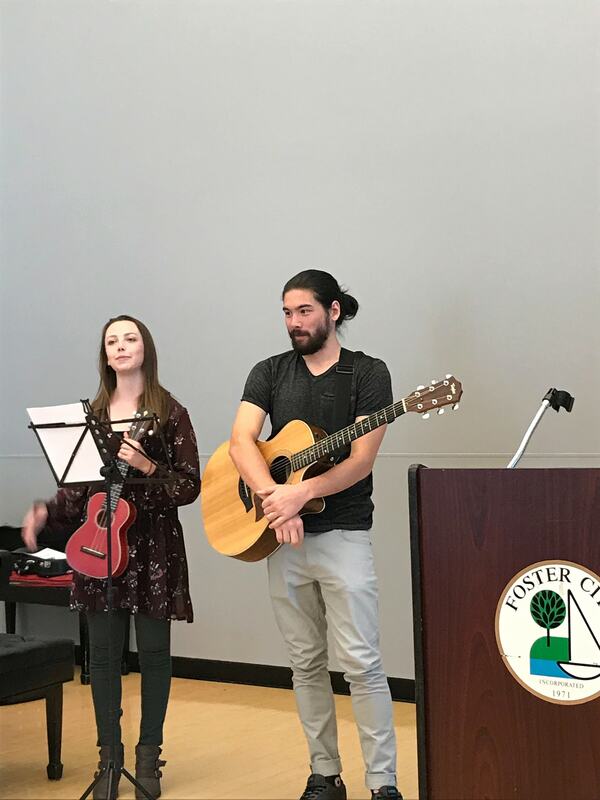 Foster City Library hosts our vocational training workshop for young adults who are seeking coaching from our music program. Workshops are taught by an alum of the same program. During the Spring Break of 2017 (04/05 - 04/14/17) DMSF together with the San Mateo county libraries was giving free masterclasses to kids at the local libraries. All together DMSF taught at nine libraries: San Carlos, Millbrae, Foster City, Belmont, Brisbane, Portola Valley, Woodside, Half Moon Bay and East Palo Alto. 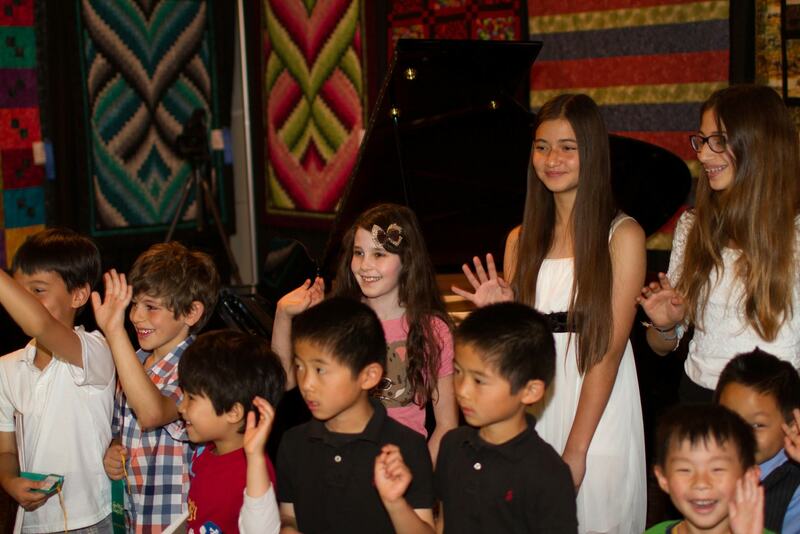 It was an amazing experience to travel, to meet and interact with kids from all over the Bay Area. And we also got to hang out with awesome librarians that were excited to see us and made a great effort in organizing and hosting the events. Shout out to: Bitian Zhang, Darren Heiber, Wan Fwu, Michelle Ng, Erin McGee, Kathryn (Kat) Wiszowaty, Mohini Dela Pena, Karen Choy and Kenny Gabe Ocana. It was our long time dream come true! On May 21st, 2017 DMSF had a Game Jam/ Hackathon Event. Event was hosted by the Rocket Fuel Inc. 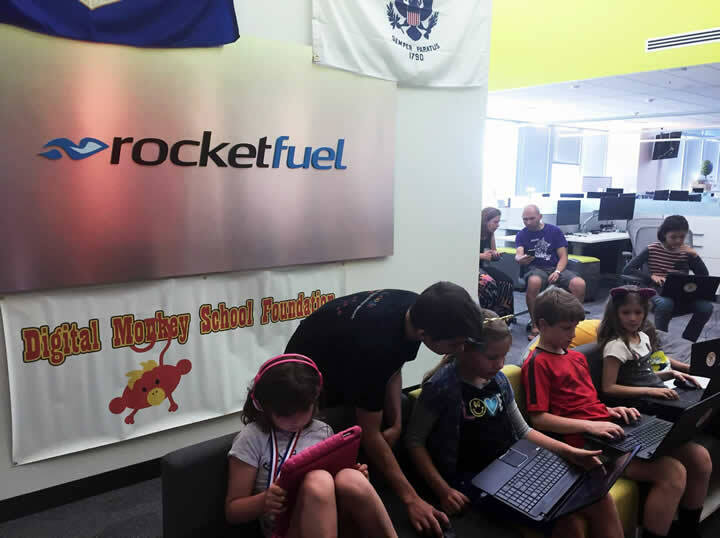 The prize fund came from a donation by Rocket Fuel to Digital Monkey School Foundation. 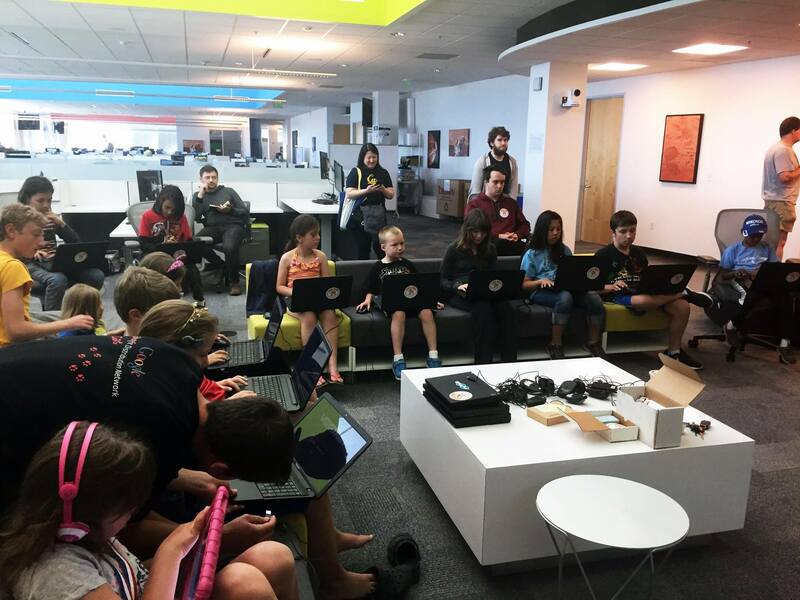 Hackathon was free and open to children ages 7 to 14 and their parents. Foundation gave out prizes for 7 to 10 and 11 to 14 age groups and participation prizes. All prizes were vouchers for Digital Monkey School classes. 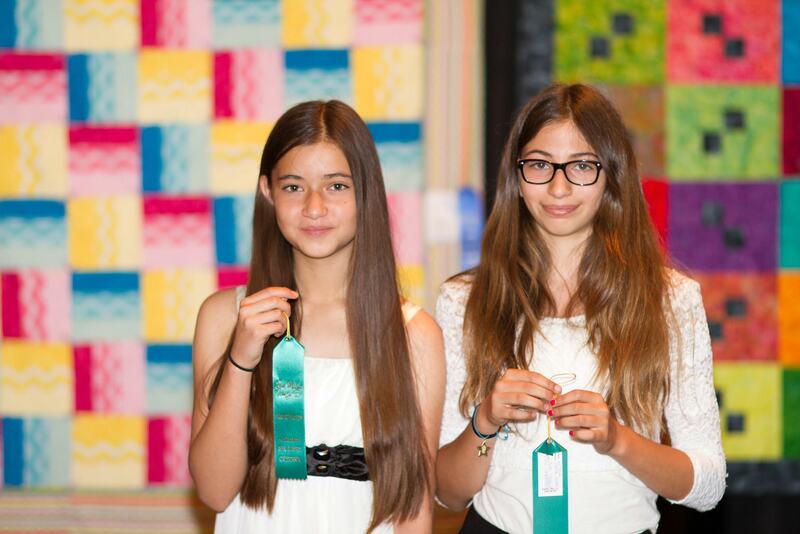 Claire Elkes (13) , Dylan Marquis (12) , Lyubov Savva (9) and Ekaterina Yagubyan (8) won first places. Digital Monkey School’s advanced students Alex Dollard, Aled Jones, Andrew Marks and Ben Selman were volunteering as Event Counselors to help the young kids at the event. Many thanks to our host and VP of Rocket Fuel Nick who have also volunteered as an organizer. On June 29th, 2017 DMSF together with Portola Library taught a free summer camp at the Pescadero Elementary School. Pescadero is a small farming and ranching community. are hoping to return very soon. 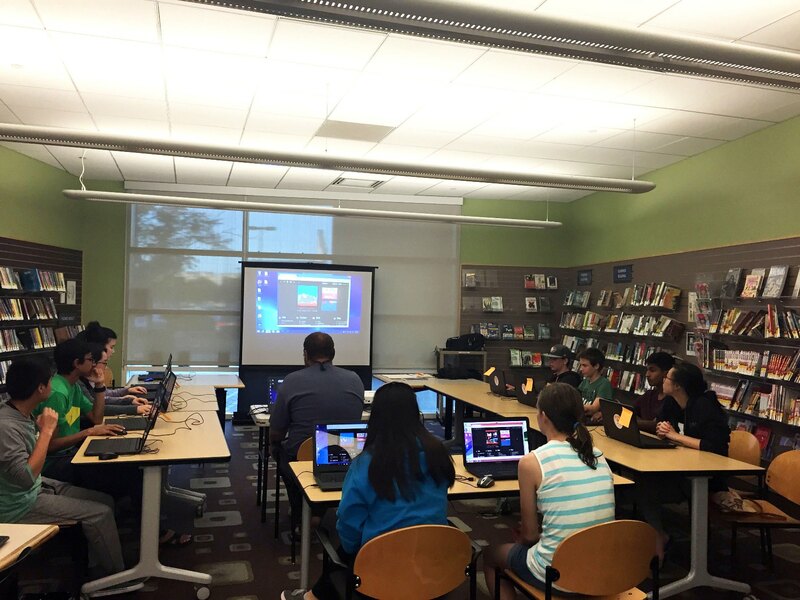 "Intro to Video Game Development" workshop. Thanks to Kelly Torikai for helping to organise this event and Elena Savva for helping out. 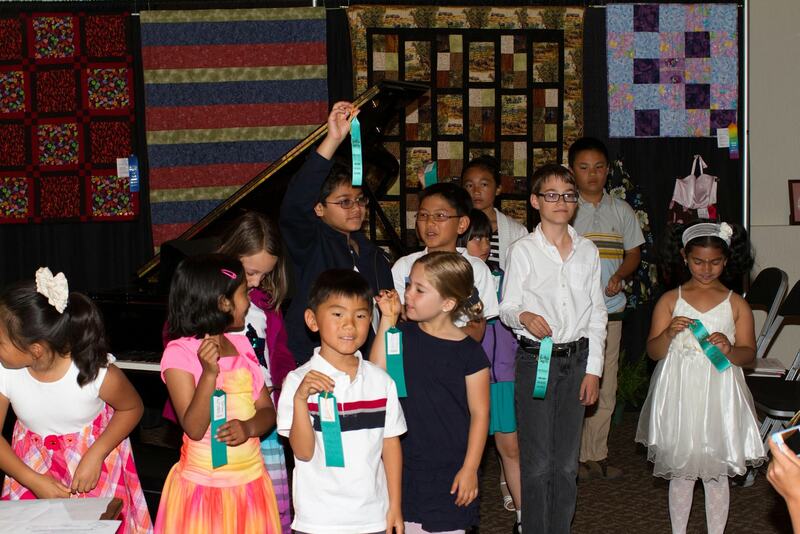 Our San Mateo County Fair workshops are always a full house each year we have kids returning from previous years. 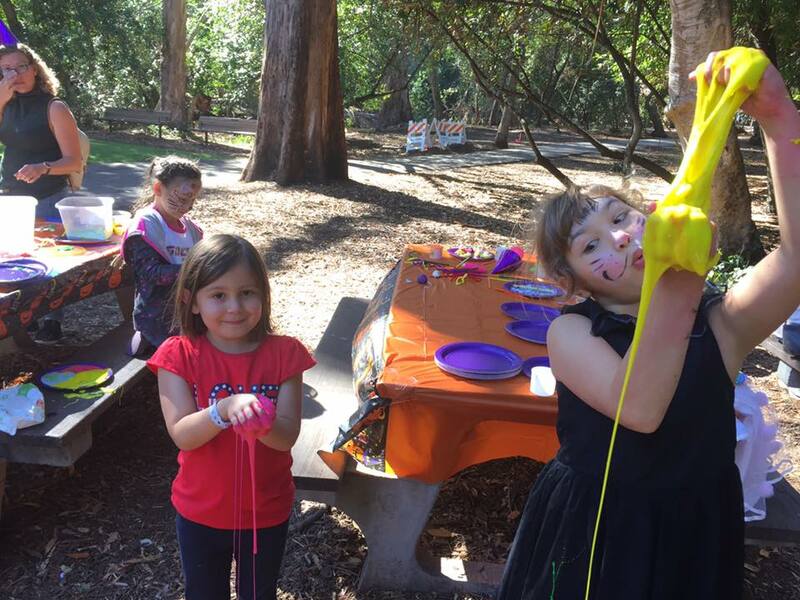 On October 22nd DMSF hosted at free Halloween event at the Twin Pines Park in Belmont. 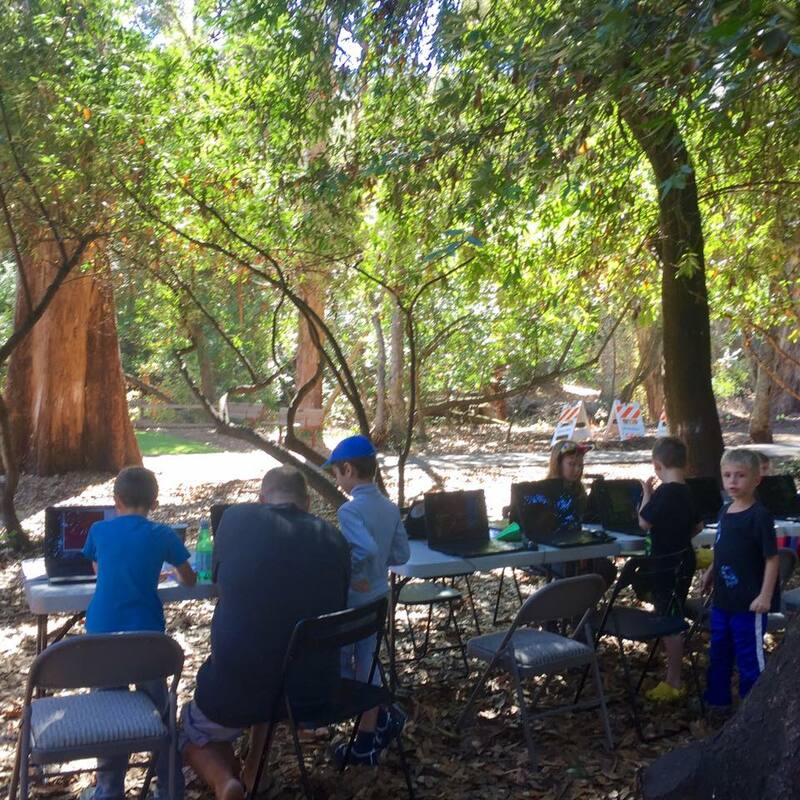 Events consisted of facepaint, station arts and crafts station, computer games development station and kinetic games. Kids were very creative modeling out of clay Halloween projects and Halloween inspired computer games. In December 2016 DMSF held a New Year themed "Introduction to Video Game Development and Arts and Crafts Masterclass" for children and parents. At the Intro to Video Game Development tables students built festive levels completed with presents, snowmen, reindeer, and holiday ornaments. 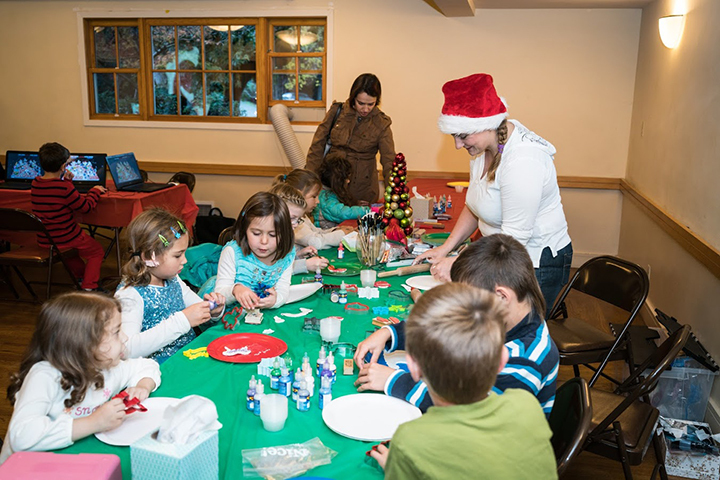 At the Arts and Crafts tables guests were making holiday ornaments and toys. 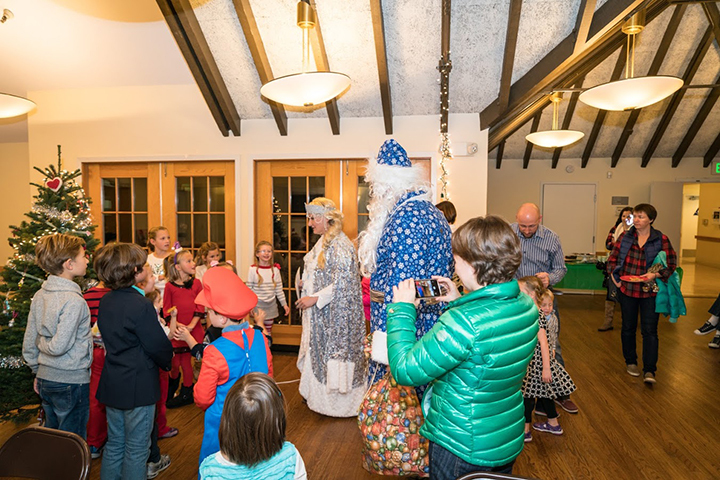 Event also included appearance of Father Frost with Granddaughter Snow Maiden and a wicked witch. 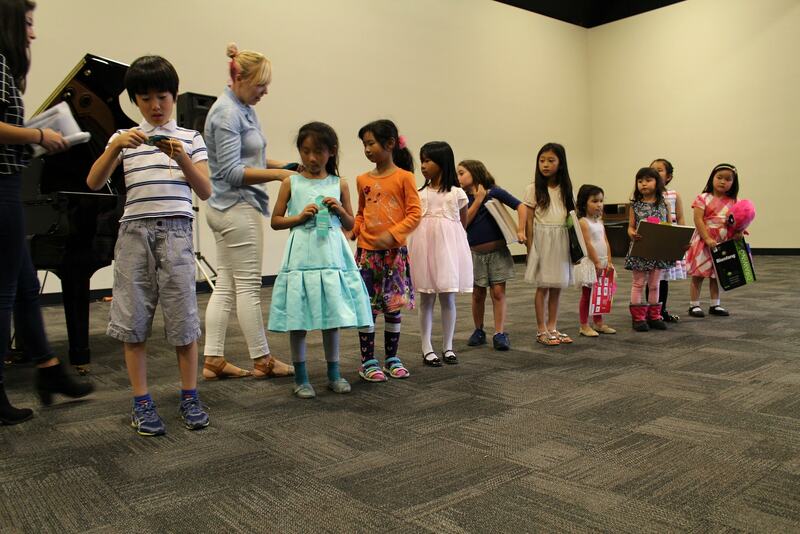 Children sang and danced around a holiday tree, answered riddles and received presents at the end of the event. Refreshments and snacks were provided. 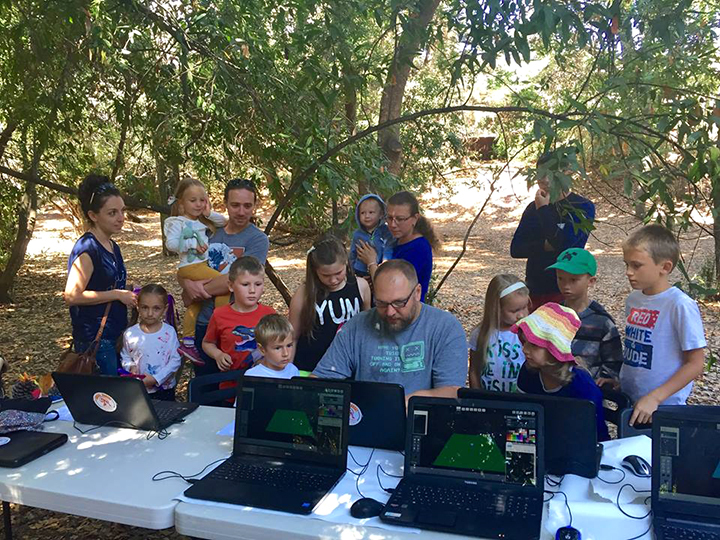 In August 2016 DMSF together with DMS staff held an Introduction to Video Game development, Arts and Crafts, and Russian Language Art Event at Twin Pines Park. 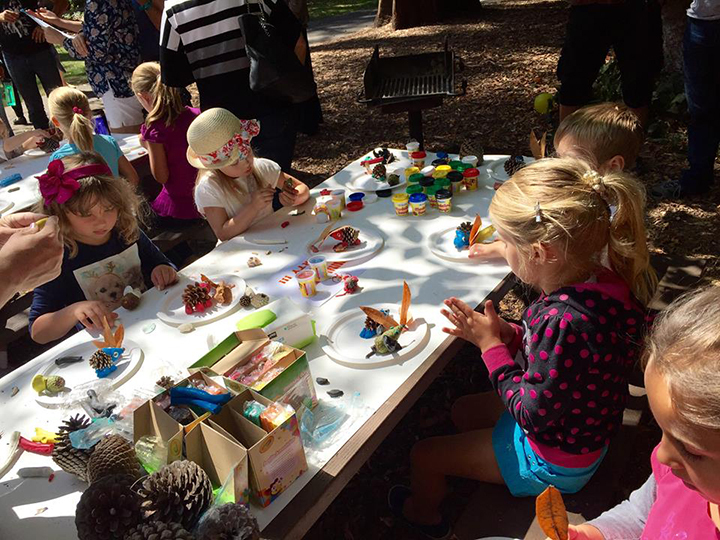 Event was free and open to children of all ages and parents. In The Fall 2016 DMSF held another Teen STEM program at the Digital Monkey School. 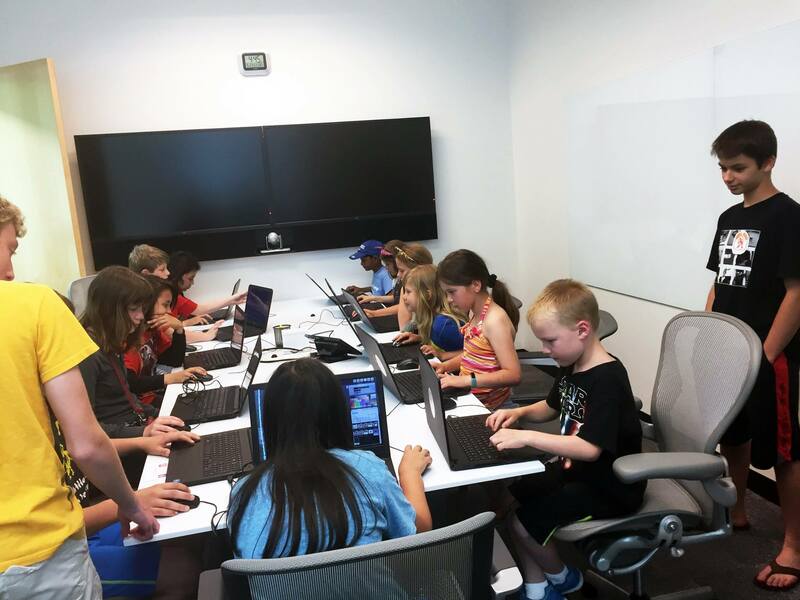 Funding for the program was made possible by a grant received from Microsoft as a result from our participation in Silicon Valley Gives, an initiative of the Silicon Valley Community Foundation. Teen Tech Program 2016 was a great success! With the generous help of the Best Buy we were able to enroll more students this year than any previous year. 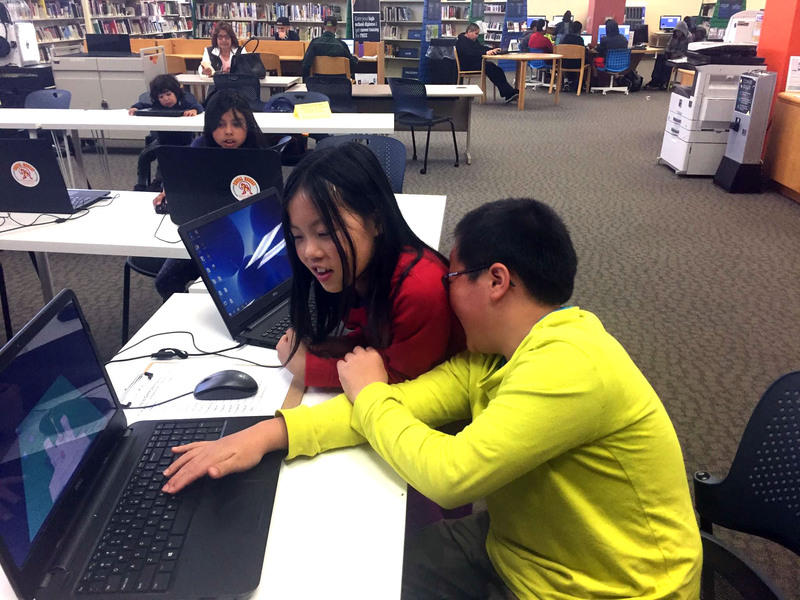 In 2016 we partnered withFoster City Library and received great help and support from the library staff, especially Wan Fwu, Youth Program Coordinator, in promoting and coordinating the program. For the first time this program was introduced in 2013 and it was a great success. We are happy to announce that we are continuing this program for the 4th time in 2016 beginning 02/02/16. 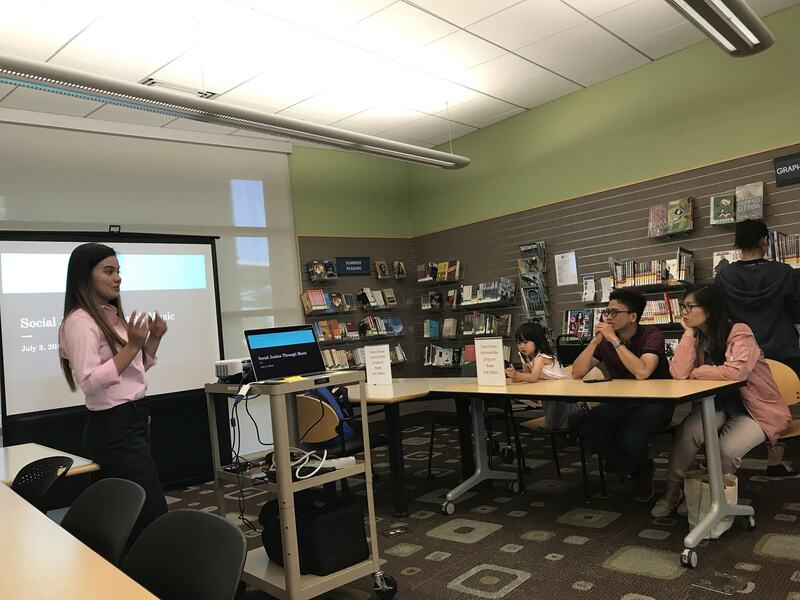 Teenagers in the greater San Francisco Bay Area, aged 13-18, are invited to participate in a program funded by a Community Grant from Best Buy. The program will be held at the Digital Monkey School at 720 El Camino Real #302, Belmont, CA and Foster City Library at 1000 E Hillsdale Blvd, Foster City, CA. Local teens will be introduced to concepts and skills related to careers in game development and digital animation and receive training to apply for a part time and full time position at Digital Monkey School. A waiting list will be established for those students who apply now, but aren't accepted into the current program due to class size limitations. 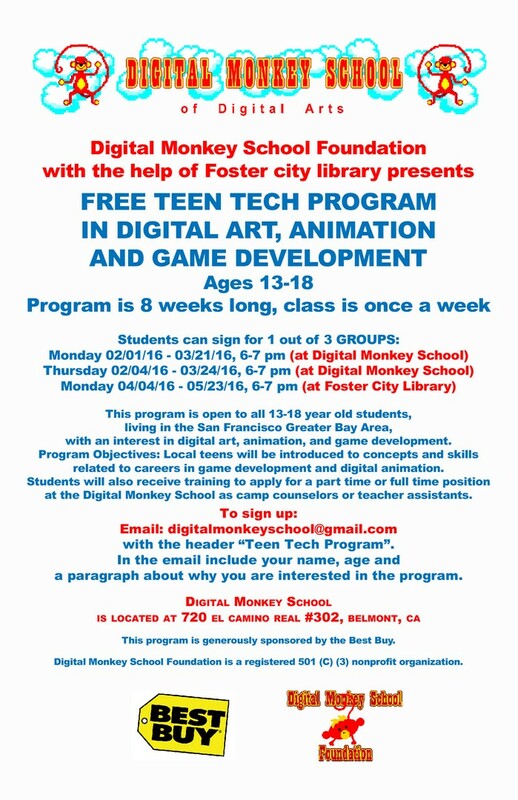 Send an email to digitalmonkeyschool@gmail.com with the subject "Teen Tech Program". The program is starting February 2, 2016. Communities enhanced by collaborative efforts and artistic endeavors. · Everyone deserves a chance to develop their skills and abilities. 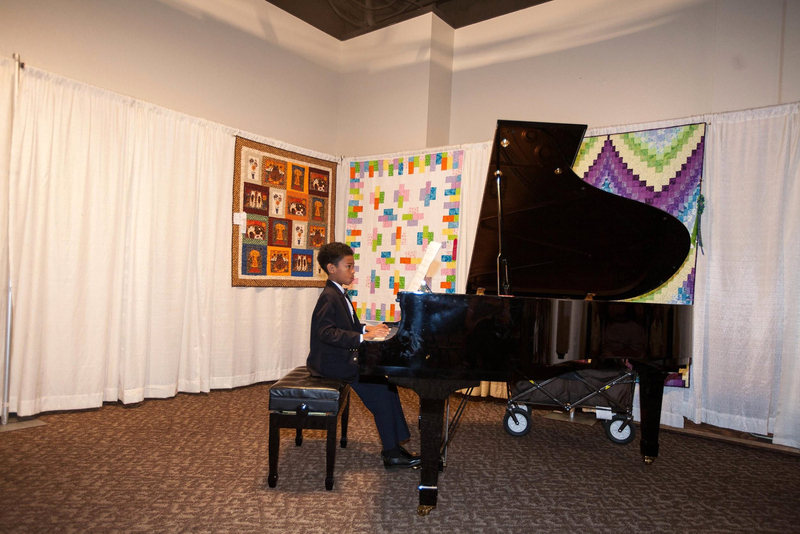 · High quality arts programs contribute to the overall development of children, teens, and young adults. · Mentoring is an effective way to develop children, teens, and young adults while involving community members. · Real world goals and projects enhance learning. · Utilizing innovative techniques, tools, and technology is vital to the success of our mission. · Planning, accountability, communication, and community involvement are important to earning and keeping the public trust. · We assist individuals in achieving their potential. · We aim to deliver engaging, high quality programs. · We strive to work collaboratively to fulfill our mission. 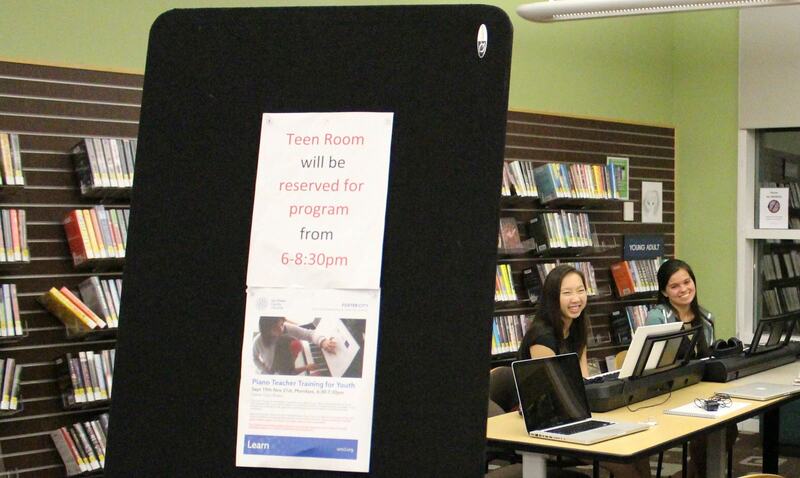 · We seek to establish and maintain a working environment appropriate for children, teens, and young adults. · We strive to recruit, train, and mentor volunteers, employees, and program participants who are passionate about our mission and agree with our values. · We preserve our credibility by being honest, objective, and accountable. · We exercise fiscal responsibility as a means of achieving our mission. Digital Monkey School Foundation is 501c3 non-profit organization. 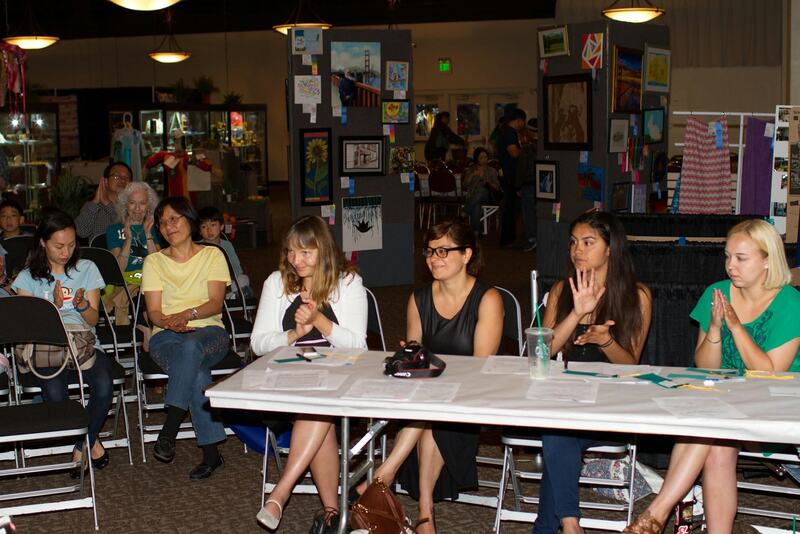 DMSF is made up of artists, educators and community members from across the California Bay Area. Our members range from professional artists working in web and software design, elementry to college level professors and members of the community. We all want to share our passion for art with the rest of the community. Greg Orduyan brings a wealth of creative experience to the Digital Monkey School Foundation. Greg’s formal education is in Fine Art and Stop Motion 3D Animation. Honored for his abilities and achievements in the field of Fine Arts, Greg has been working with 3D technology since 1991. Greg’s experience includes working in animation studios, TV stations, and game development studios, as well as FX and CG production studios. While working at Sony, Greg developed online services and content for the PS2 and the game “Frequency.” During his six years at Konami, Greg developed games such as “Frogger The Great Quest” for PS2, “Silent Hill 2” for PS2, “ESPN Baseball Tonight” DC, “CastleVania (Resurrection)” DC, and N64 “Bottom of the 9th” 98 and 99. He also has experience with coin-op games. More recently, Greg has been mentoring and teaching aspiring artists and art instructors on the San Francisco peninsula. In April 2006, Greg founded the Orduyan Center. The Center’s mission is innovative art and music education, promotion of art, and independent development of video games and animation. 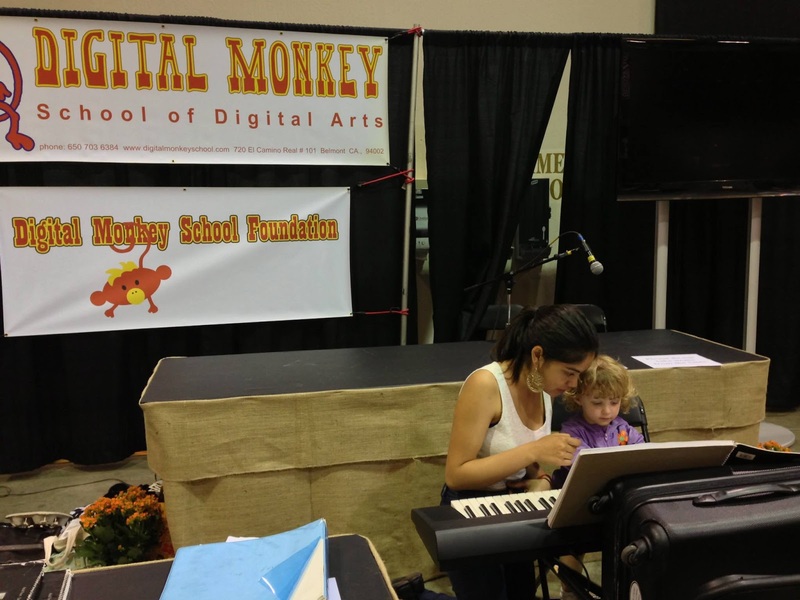 The Digital Monkey School is a core component of the Orduyan Center. Greg is furthering his efforts and attempting to reach more children, teens, and young adults, through the non-profit Digital Monkey School Foundation. 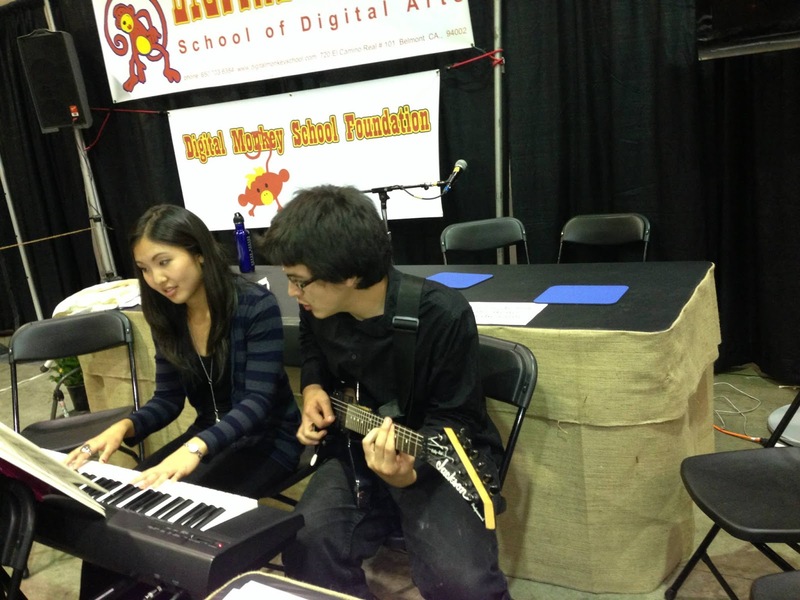 Elena is the Director of Music and a co-founder of Digital Monkey School and The Digital Monkey School Foundation. She was classically trained in Moscow. 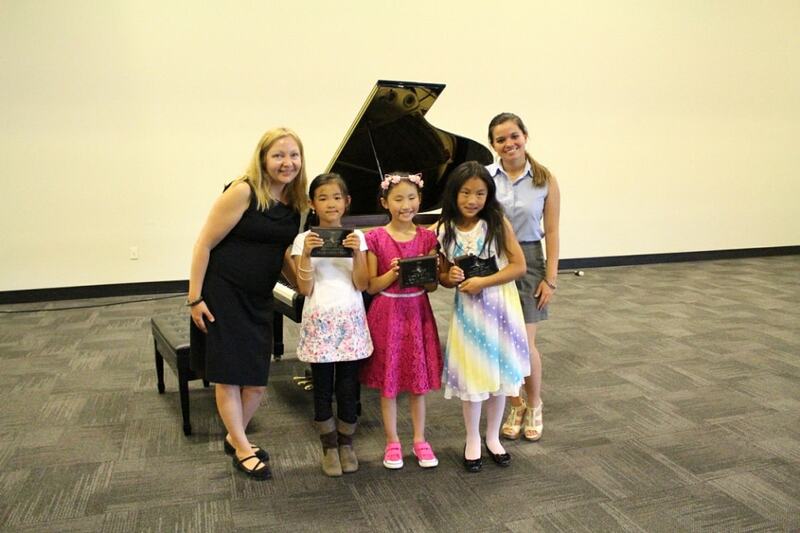 While she constantly continues to expand her own skills, Elena has developed an instructional method, which she has tested and modified over the years, for students to learn music. 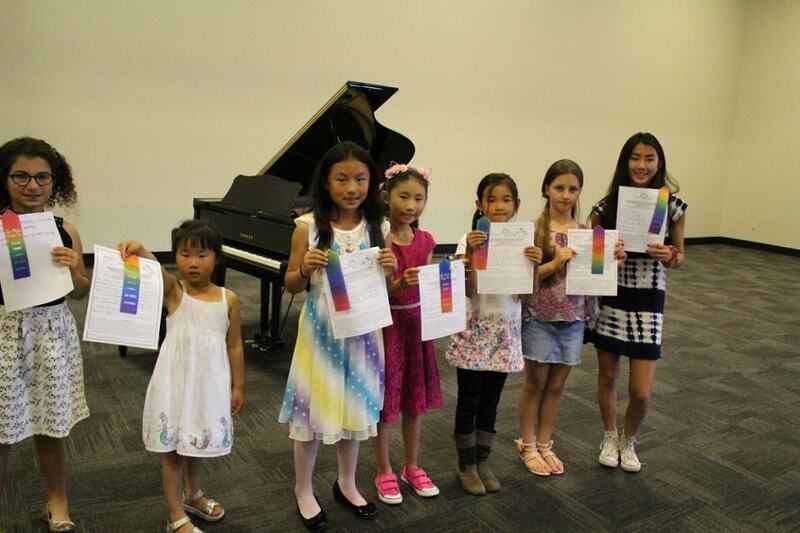 This method is a compilation of various piano methods and includes her personal insights. As a CPA (inactive), Ms. Markt will focus on accountability, internal controls, and financial reporting. As a former teacher, with a Masters in Education, Marianne will assist with curriculum development. Marianne also plans to develop and expand community programs, including collaborating with schools, libraries, after-school programs, educational foundations, community centers, and other non-profits. Marianne’s previous board experience includes Big Brothers/Big Sisters of the Peninsula and the American Society of Woman Accountants, San Francisco Chapter. 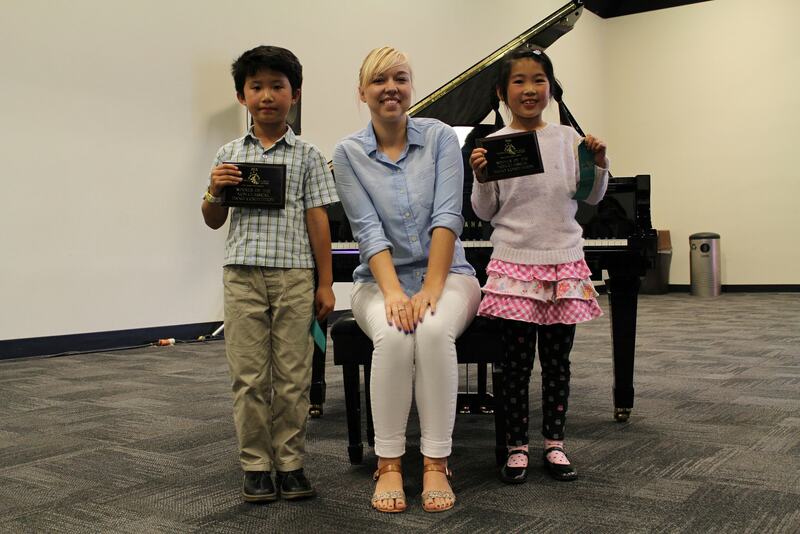 She volunteers with Project Read at the Redwood City Library and is a former Big Sister. Ola is Digital Monkey School Creative Director, she is teaching Digital Painting and Game Development Classes.She started her career doing set design at the Animation Studio on Television in Moscow, Russia.Saint Petersburg Academy of Theater Arts, Russia, BFA in Set Design,1994-96. Concordia University in Montreal, Canada, BFA in Graphic Design, 1998-2003.Ola worked in graphic design from 1996, also doing illustration and layout for magazines.Ola put together DMSF art shows and helped teaching workshops at San Mateo County Fair. She is also coordinating and helping teach the Teen Tech Program. 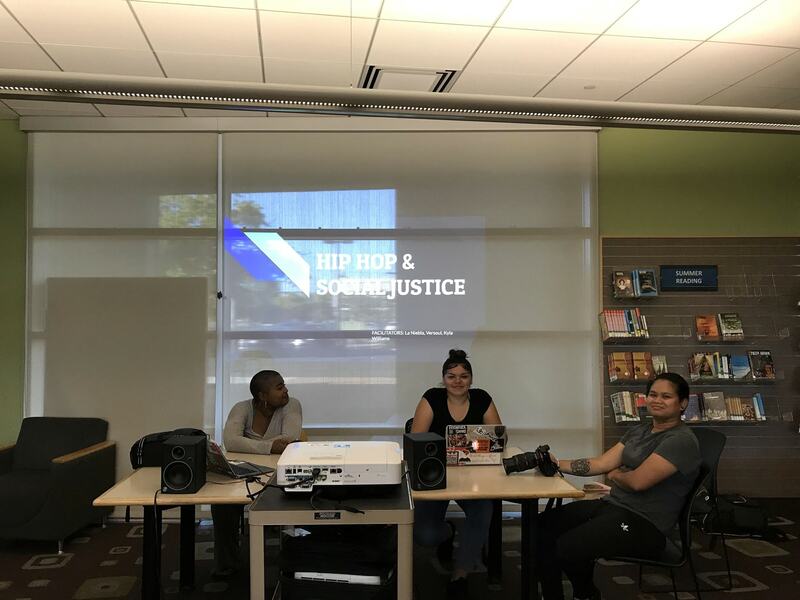 n 2018 with generous support from California Humanities For All, Digital Monkey School Foundation and the Foster City Library presented Socia Justice Through Music, a five-session weekly series. 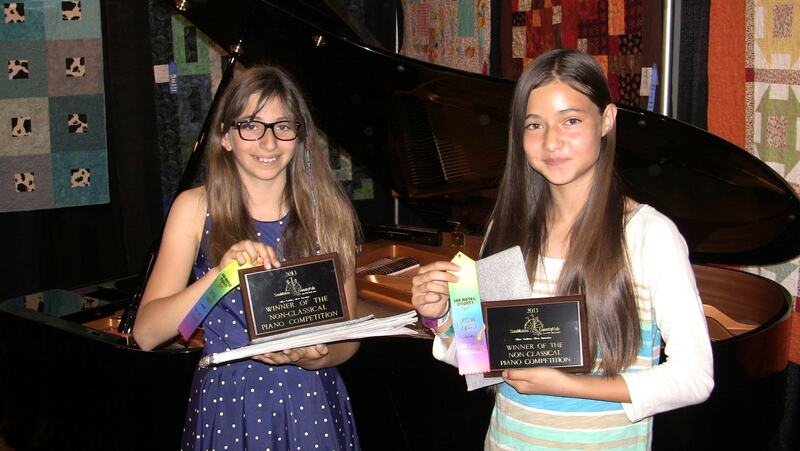 This year DMSF held an annual event of Non Classical Piano Competition at San Mateo County Fair. 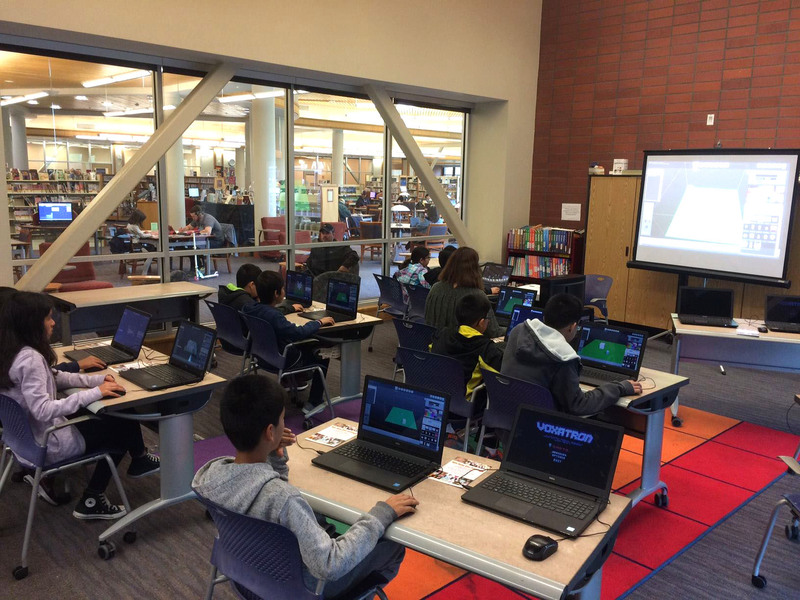 During the Spring Break of 2017 (04/05 - 04/14/17) DMSF together with the San Mateo county libraries was giving free masterclasses to kids at the local libraries. On May 21st, 2017 DMSF had a Game Jam/ Hackathon Event. 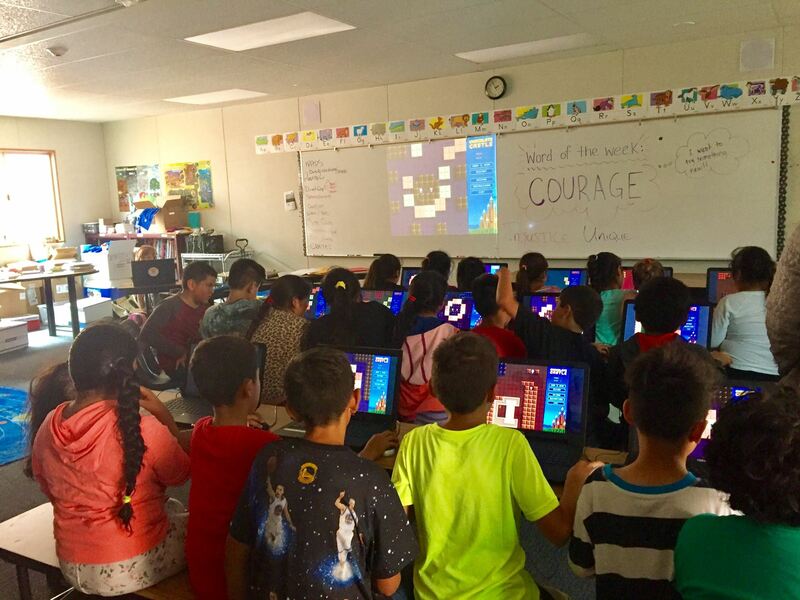 Event was hosted by the Rocket Fuel Inc.
On June 29th, 2017 DMSF together with Portola Library taught a free summer camp at the Pescadero Elementary School. 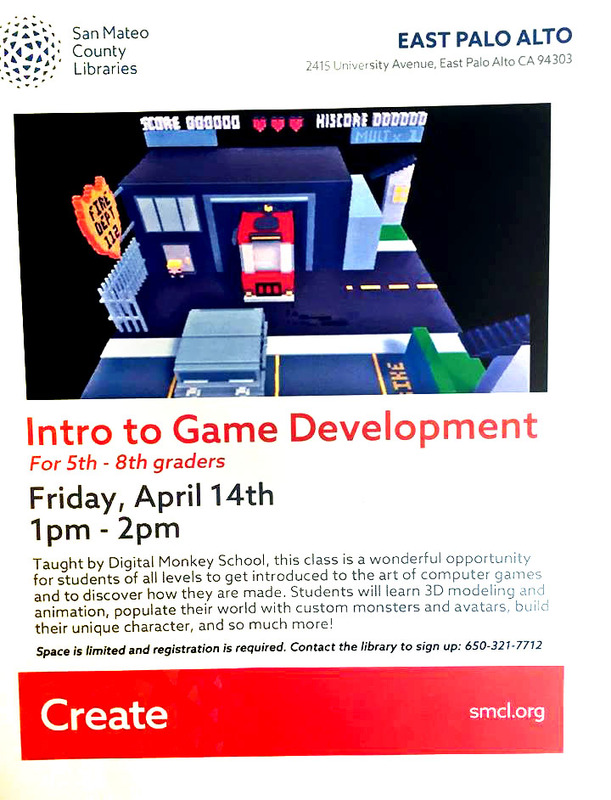 "Intro to Video Game Development" workshop. 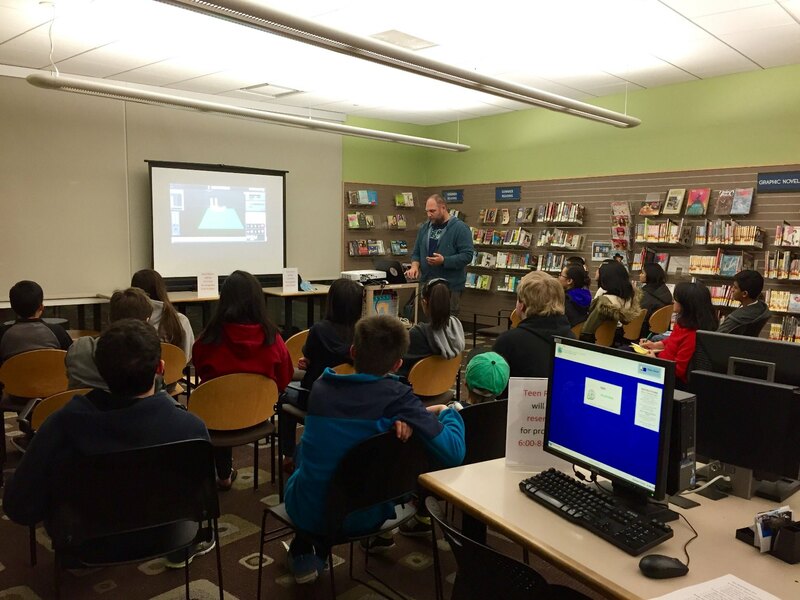 Teen Tech Program started February 02, 2016. We were able to enroll 20 students this year with 50 people on the waiting list. Great Success! 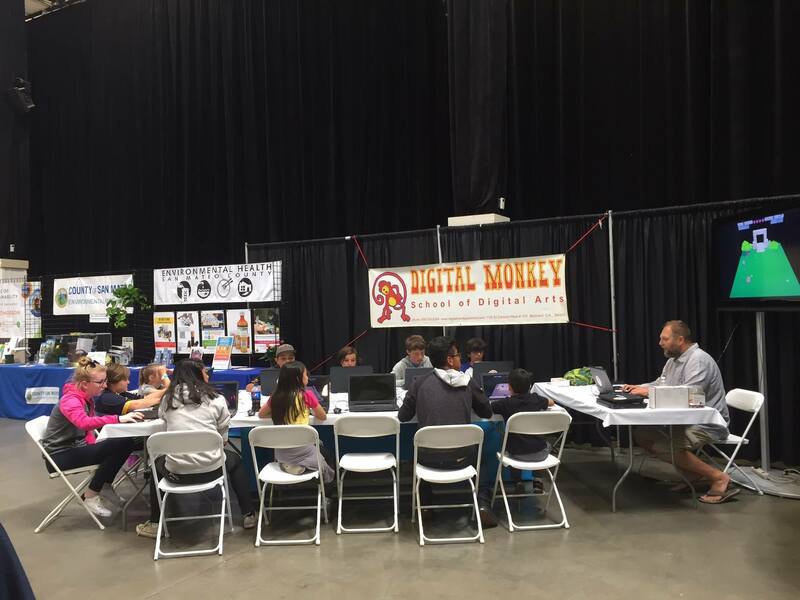 For four years now every day during San Mateo County Fair Digital Monkey School Staff was giving free workshops for kids in Digital Art, Game Development and Animation. It was a great success, kids loved it! We are hoping to be back this year! 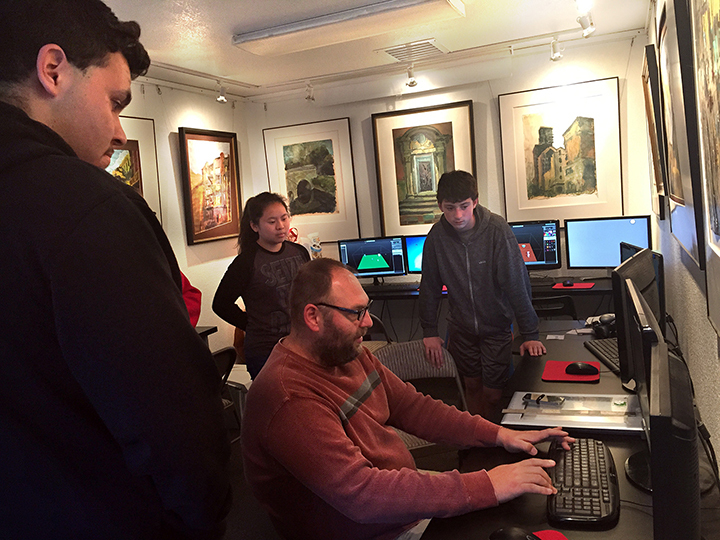 For three years now every day during San Mateo County Fair Digital Monkey School Staff was giving free workshops for kids in Digital Art, Game Development and Animation. It was a great success, kids loved it! We are hoping to be back this year! Digital Monkey School Foundation just put on a new show of students’ paintings, digital art and collage from our Summer Camp at Peet’s Coffee and Tea at 1200 El Camino Real in Belmont. The “meet and greet” date is still to be determined. 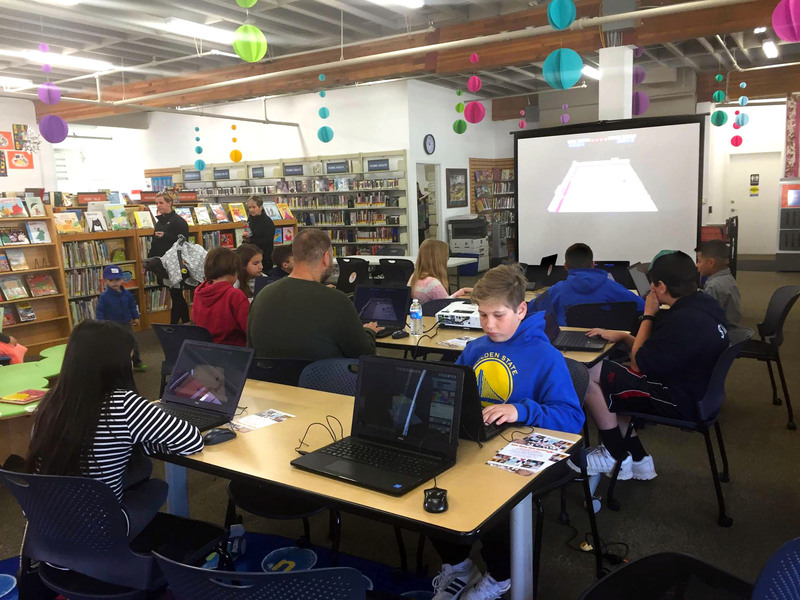 Every day during San Mateo County Fair Greg and Ola were giving free workshops for kids in Digital Art, Game Development and Animation. 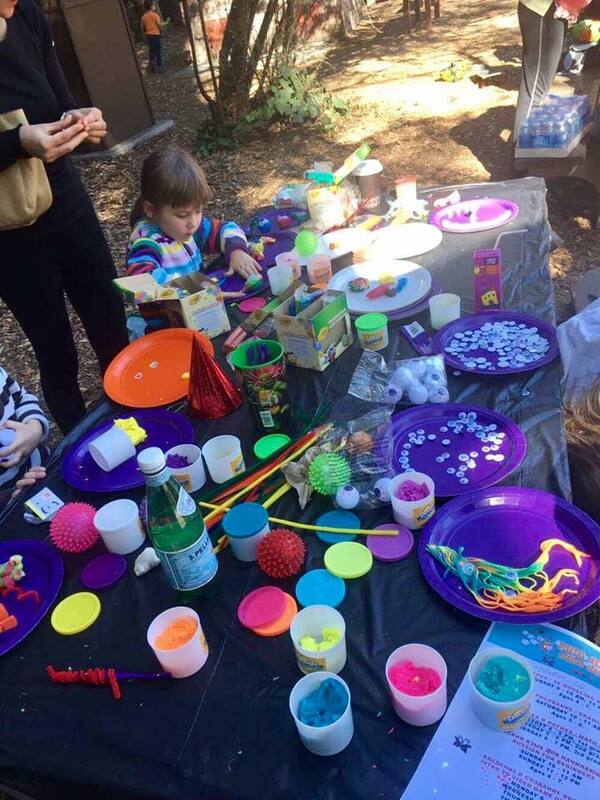 It was a great success, kids loved it! We are hoping to be back next year! Digital Monkey School Foundation currently has an ongoing show of digital works at Peet’s Coffee and Tea at 1020 Park Place in San Mateo. Show is very well received, generates a lot of interest from community members. The “meet and greet” date is still to be determined. Digital Monkey School Foundation had a show of students’ works at Peet’s Coffee and Tea in 1200 El Camino Real in Belmont in February-April 2012. We got great feedback from customers and Peet’s associates! We had show participants “meet and greet” where students and their friends were treated to hot chocolates and treats. Feel free to drop us a line at digitalmonkeyschool@gmail.com!